Like any big Shakespeare fan, I collect productions of “MacBeth.” This dark and cynical tale contains some of the Bard’s finest language, and its focus on the rapidity with which ambition can overtake ethics certainly resonates in our modern world. Besides, its mystical aspects provide a rich canvas for a good director. What form shall the witches take? How shall the superstitions inherent in the piece be incorporated into the larger play? Now, at A Noise Within in Pasadena, director Larry Carpenter has set his play in no time and every time, where swords occasionally compete with pistols and modern military garb blends with 15th century armor. In the midst of it all, three amorphous characters take on most of the “minor” roles – servants, doctors, murderers – when not embodying the witches who spark the madness. It’s great entertainment, with its aura of doom and its constant physical engagement with the audience. Even some of those scenes which often become awkward have a consistency of vision which pull them into the spookiness of the whole. Elijah Alexander is MacBeth, making him a likable man, but a man of physicality – easily manipulated by desires, whether for his honor, his wife, or power – not a man to ruminate on consequences before it is too late. Jules Willcox steams as his lady, radiating a passion which moves MacBeth to murder, yet is not going to be able to control the resulting whirlwind which puts him largely beyond her reach. As these two collide with and repel each other, the rest of a strong cast rounds out the story of their whirlwind. 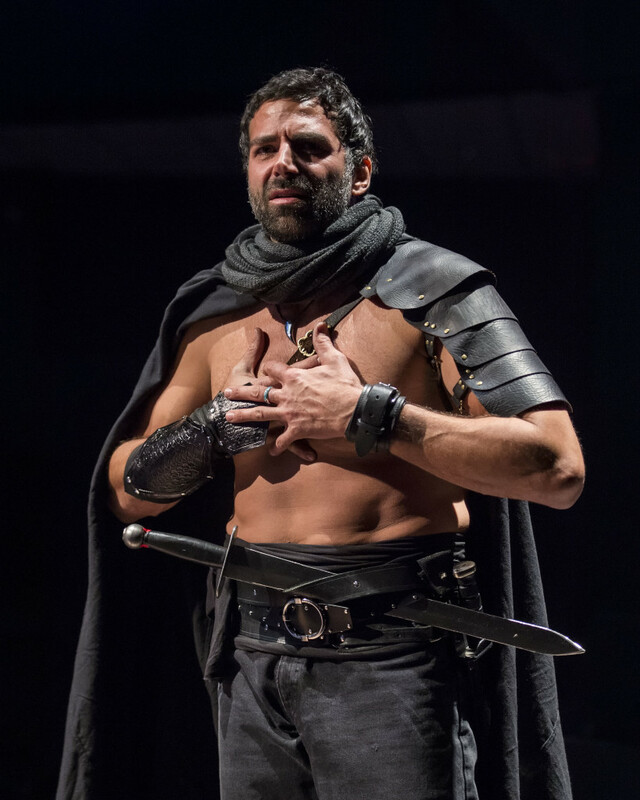 Matt Orduna’s solidly noble Duncan plays well against MacBeth’s lighter-weight sensibility. Leith Burke’s Banquo becomes the image of the stalwart, if admittedly somewhat ambitious friend, until he is undone. David DeSantos’s resolute, wise MacDuff, gradually working to right the ship of Scotland, echoes Duncan’s nobility and intelligence. Feodor Chin, as that odd combination of wisdom and changeable nature, Duncan’s son Malcolm, makes his vagaries almost make sense. Katie Pelensky and Theo Taplitz, as MacDuff’s doomed wife and son, create a moment of light and home in the midst of the terror. Still, it is the witches who give the play its focus and fascination. 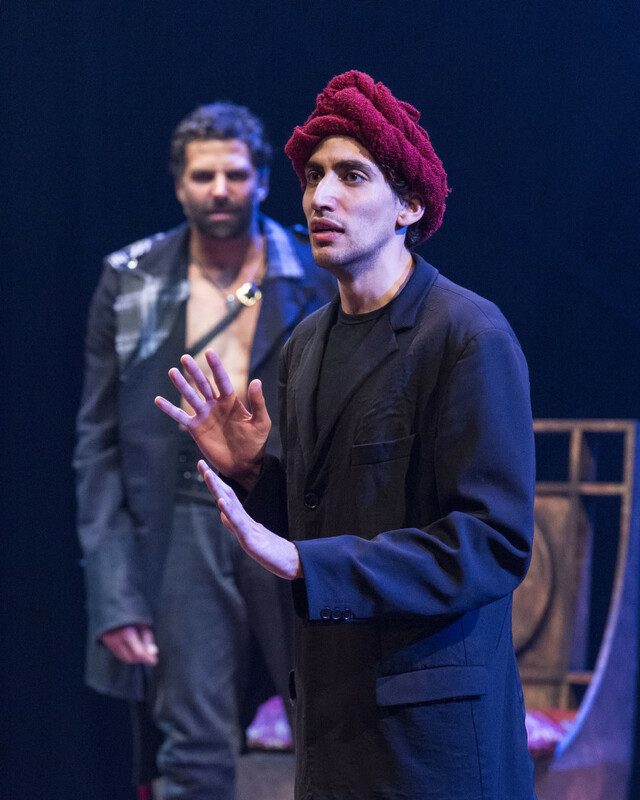 Amin El Gamal, Thom Rivera and Jeremy Rabb create the rich foreboding and mystery which elevates this production, not only in their initial roles but as many other smaller elements – a necessity when spreading 28 major and minor characters among a cast of 17. They also effectively underscore how central the idea of the evil is to everything in MacBeth’s life, as, for example, they enhance the often badly handled “dagger I see before me” speech in a way both literal and spooky. Standout in all of this is El Gamal’s truly creepy androgynous servant, who can make one’s skin crawl as a complicit voice of doom. Carpenter’s use of ghosts – not just that of Banquo, but the gradually swelling host of MacBeth’s silent, observing victims – emphasizes the sense of doom, and underscores the madness of the storyline. It’s a great concept. 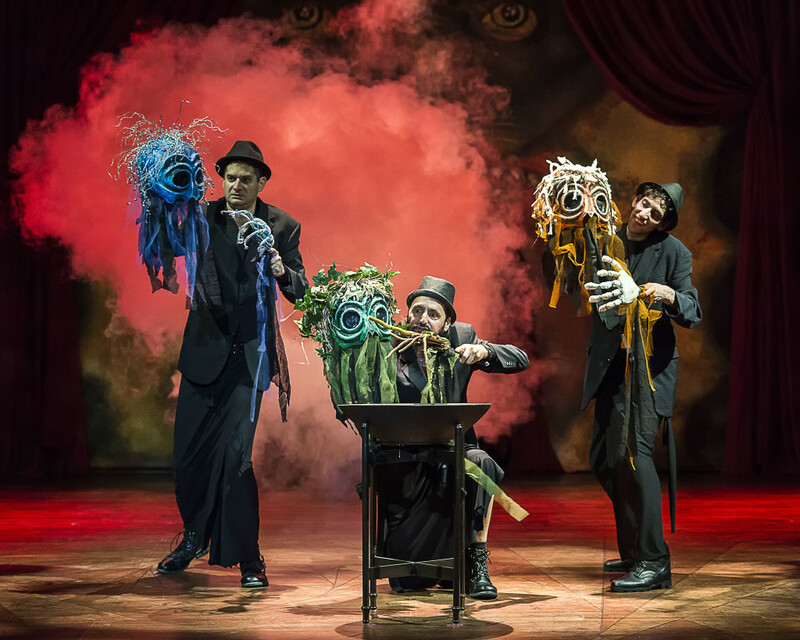 Their otherworldliness as witches is aided by Sean T Cawelti’s fascinatingly simple, yet creepy bits of puppetry. Susan Gratch’s facile platform of a set and evocative lighting set the tone of dark portents. Jenny Foldenouer’s fanciful costuming allows both the swift-change aspects of the witch characters and the quick definition of everyone else. In short, from the consistency of tone to the layered portraits to the clever and facile use of witches, this “MacBeth” is a treat. By paring down the often overwhelming volume of persons onstage, the central characters stand out more brightly, and the point is more effectively made. In short, it’s a finely crafted production worthy of sold-out audiences, and a true pleasure for a longtime Shakespeare aficionado such as myself.